Image via Flickr user Jonathan Pobre. Warm, roasted turkey, a plethora of home made food, family and friends all around, football, and a chance to be grateful for what you have. Who doesn’t love Thanksgiving? It’s difficult to see why anyone wouldn’t look forward to a holiday that involves a plethora of scrumptious food, family gatherings, and appreciating everything we have. As we take a day to celebrate, however, a dark cloud looms overhead. While almost everyone looks forward to the holiday, some have come to dread it due to its successor: Black Friday. According to blackfriday.com, this shopping frenzy began in 1924, around the time of the Macy’s Thanksgiving Parade. Police in Philadelphia first coined the term in the 1960’s, to describe the chaos that came the day following Thanksgiving. For many, this day marks the true beginning of the holiday season, and is a day for scoring the best deals on gifts. The day is perceived differently from a retail employee’s perspective. This Friday will be my third consecutive year working Black Friday. While I have not yet had the pleasure of working the midnight shift, I’ve still seen the down side of this post holiday frenzy. People begin arriving at stores hours before they open, cutting into their Thanksgiving, in hopes of getting a good parking space. They fight their way into stores and spend the day running around, hunting for the best deals. And all for a few sales. In fact, the store I work at didn’t even start their Black Friday sale until that Saturday. It’s easy to see why some people get caught up in the idea of Black Friday sales. Advertisers do an excellent job appealing to the public eye and creating a hype around sales. However, Thanksgiving is a time to celebrate what we do have (and I do not mean material goods). Thanksgiving is a time to be grateful for all the joy in our lives, the kind that comes from those around us. 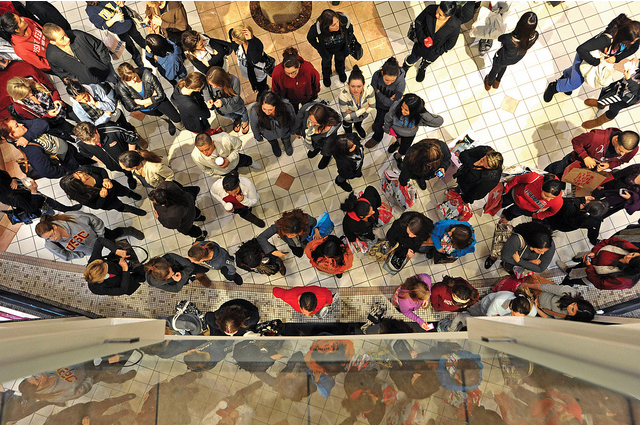 By turning the day after Thanksgiving into a shopping frenzy, we are losing that focus. Millions of people spend Black Friday fighting for a parking space, waiting in lines, and hunting for the best deal, but take a second to as yourself: is this what you really want to be spending your holiday doing? My employment at a retail store is all it took for me to see the real black side of Black Friday. It is easy to get caught up in all the materialism of the day. Who doesn’t want to get the best deal on holiday gifts that their friends and family will love? I think Americans need to reevaluate their holiday priorities. While getting gifts for everyone you love is an amazing feeling, those hours you spend in line and in stores could be spent enjoying time with those loved ones. And there is really nothing more valuable than that. It’s no secret that Emerson students have a very unique sense of style. Just taking a look around campus makes it clear that fashion sense here is quite different from anywhere else. However, what may be the height of fashion here on campus may not be as acceptable once you begin your first real job. So do you have to sacrifice your personal style to get your dream job? Not necessarily. When entering the business world, your sense of style should take on a more mature look, but still manage to remain young and unique. So how do you figure out how to stay adult, yet distinct? In a city such as Boston, it’s easy to figure out what to wear to work. Just sit outside an office building, and you’ll see a parade of professionals going in and out that can inspire you on how to incorporate yourpersonality into your work look. When sitting and observing the businessmen and women of Boston, I noticed many use bright colors and patterns to stand out among their peers. Women often sport bright colored dresses or patterned handbags to avoid looking too drab. A trench coat in a pop color is another way to add color to your wardrobe and to the grey, dreary days of winter. Stick with only one pop color or pattern at a time though, to keep the look serious, not silly. Men on the other hand, can show their true style through patterned ties or even bright colored bow ties! Your style doesn’t have to end at your ankles. Though you should leave your club heels and comfy moccasins at home, there are still many fashionable footwear options for the office. Since a typical day in the city can consist of lots of walking, many Boston women wear bright ballet flats or oxfords to work as a practical solution to heels. Men too, aren’t just limited to dress shoes. Boat shoes and loafers are comfortable and stylish, yet are acceptable in the office. It’s easy to see why not everyone wants to comply with office dress codes. “Wherever you get young creative minds, you’re not going to find people who want to wear what somebody else tells them to,” says Chris Faraone of local newspaper, The Boston Phoenix. However, when you’re working a job, you’re representing a company and it’s important to dress professionally when doing so. Through a variety of colors, patterns, and prints though, it’s now possible to be professional, while being yourself.